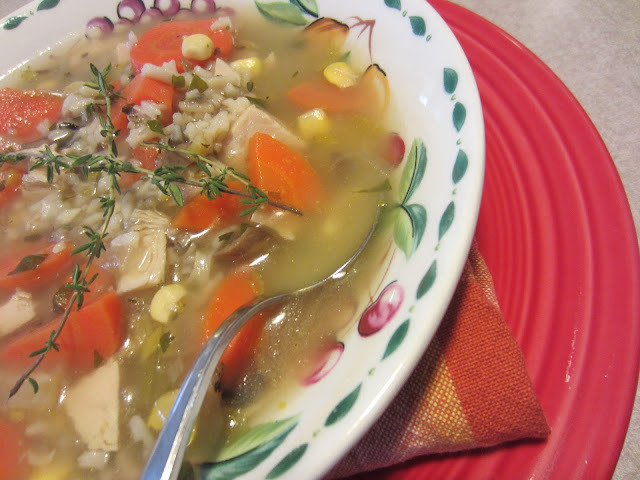 Turkey and Wild Rice Soup....Leftover Magic! If you haven't used up all of your Thanksgiving leftovers yet....this is a wonderful soup recipe that should do the trick! It uses cooked leftover turkey, leftover carrots ( from dinner and from the raw veg tray), leftover celery ( from the veg tray), leftover corn ( from dinner), leftover fresh herbs ( from the turkey and the stuffing that you didn't use up), and all that chicken broth you overbought "just in case"! lol I didn't have a turkey carcass at my disposal, but you could certainly add that to enhance the broth if you have one. And if you don't have the leftovers to make this soup, you could start from scratch too! There is no denying it....soup is a great bargain for the weight conscious eater! What a great way to get back on track after Thanksgiving! The real secret to this soup is the Uncle Ben's Long Grain and Wild Rice original recipe rice mix. 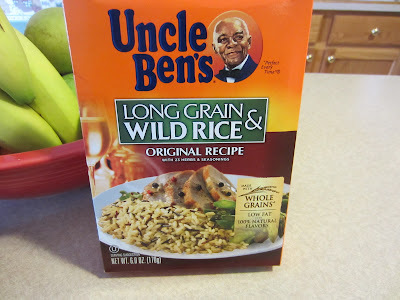 The seasonings in this rice are wonderful and help flavor the soup nicely. Just had some for lunch on this cold and snowy Ohio day! 1. Prepare the rice according to pkg directions WITHOUT adding any fat ( butter or olive oil). Cook the rice until it is almost done ( 15 - 20 min). It's ok if there is still a lot of liquid. Take off heat and set aside. 2. In a large stock pot or dutch oven, heat the olive oil over med-high heat. Add the onion, celery, and raw carrots, if using. If you are using cooked carrots, you will add them later. Cook for 5 - 6 minutes or until they start to soften. Add in the garlic, bay leaf ( leaves), and thyme and cook for 1 more minute. Add in the mushrooms. Allow mushrooms to start to soften, 2 - 3 minutes. Add in all of the chicken stock. 3. Cover the pot loosely and allow the soup to come to a boil. Turn down to simmer. Simmer, loosely covered until the vegetables are soft. ( 15 - 20 minutes or so) Add in the reserved rice mixture, cooked or frozen corn, cooked carrots ( if using cooked ones), parsley and turkey. Season with salt and pepper, to taste. Continue to simmer until heated through. Squeeze half a lemon into the soup. Remove bay leaf ( leaves). Enjoy! At our house, on Thanksgiving, we not only have turkey, but we also have a Spiral Sliced Honeybaked Ham each year. One of my favorite ways to use up the leftover ham and the ham bone is making my Classic Ham and Bean Soup...but I also like to make a ham salad spread. It's so easy. I don't have the exact measurements for this recipe, so I can't tell you what the nutrition information is...but I can tell you, it is delicious! It's super easy too! 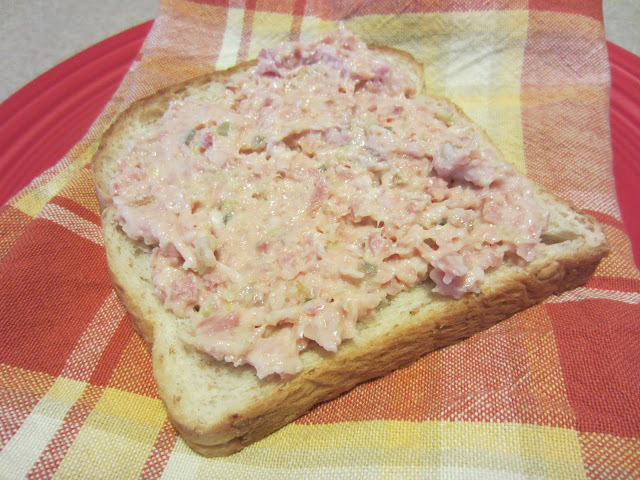 Just pulse some leftover ham slices in the food processor until ground up. Remove to a bowl. Add one or two stalks of roughly cut celery and pulse until finely diced. Add the celery to the ham in the bowl, along with some light mayo, some sweet pickle relish and just a bit of horseradish sauce. OMG...I dream about this spread! The boys all love it too. *Update!! For an entire post on this recipe for ham salad spread go HERE! If you haven't left a comment yet to try your luck at winning The Cookiepedia...there is still time! Now that the holiday baking season is getting into full swing, this cookbook would be a wonderful addition to your collection! Go HERE for details! I love how low points that soup is for a generous serving. When I was a king my mom bought the best ham salad from a local deli. I have never thought to make it myself - so thanks for the recipe! Hi Renee. Just catching up on your latest posts (I'm so behind in my blog reading). This looks like "comfort in a bowl". Hope you have a fantastic week.